Hand lettering composition and intricate, well balanced layouts are probably one of the main struggles beginners face in their lettering journey. Like with most things, learning how to hand letter multiple words in an appealing layout (with confidence) takes time and practice. But things don’t necessarily need to be so complicated, and in this article you will learn how you can take your composition game to a whole new level! We’ve teamed up with a lettering artists who decided to take the matter in his own hands, and created a lettering tool that will completely change the way you look at lettering compositions. Nico Ng is a multi-disciplinary designer & lettering Artist based in Manila, Philippines. After getting his degree in engineering, he decided to pursue the creative path instead. Nico now runs his own stationery business (www.RueHigh.com), does lettering commissions and teaches lettering workshops internationally. 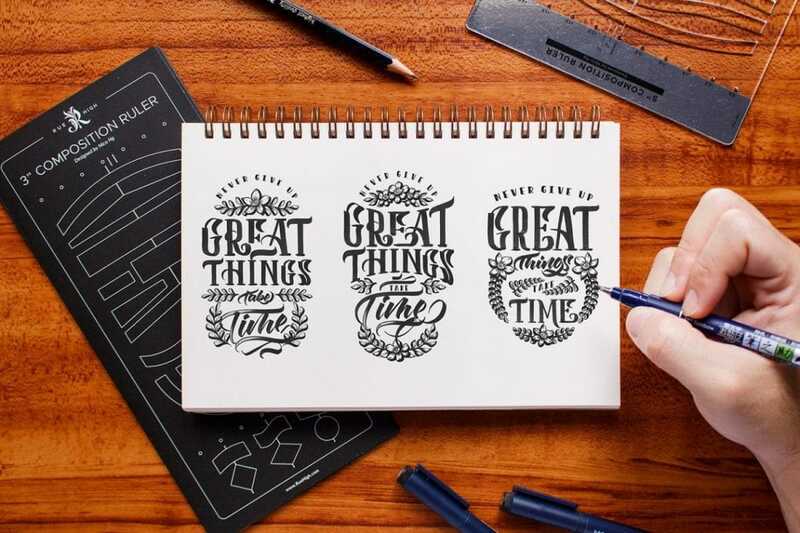 In this article Nico will show you how his product will help you to create stunning lettering compositions in no time! My name is Nico and my story began by seeing a lot of awe-inspiring, well-designed lettering composition on Instagram and Pinterest. I picked up my favorite pen and attempted to create my own lettering composition on fine acid-free specialty paper. After finishing my work in about ten minutes, well, let’s just say, I was deeply underwhelmed by the outcome. I didn’t understand yet what it takes to create a successful lettering composition. Since that day, I learned something really important about designing successful lettering layouts. The main difference of an amateur from a professional work is not just in the tools, the materials, or the quote. The difference lies in the process and in the details. Let me share with you how I managed to dramatically improve my work by reconsidering the process of creating a proper lettering composition. What I thought back then was to execute the first idea I could think of, figure everything out as I do the actual lettering and make the necessary modifications as I go along. Creating a stunning composition requires careful planning and precise execution. Like any other craft, taking the fastest and easiest way isn’t the best way to go. If you analyze successful lettering compositions, you will notice that everything wasn’t randomly put together, every word has been carefully thought out and purposefully placed in specific areas. In the planning stage, you will go through several factors and design considerations. the shapes you will assign to each word group. Another characteristic of a successful lettering composition is that it never looks sloppy. Everything should look consistent, aligned and in the right place. No detail is too insignificant to ignore. And the easiest way to achieve that is to rely on accurate guides. If a building is as strong as its foundation, so is a lettering composition as good as its guide. Obviously, all these require time. A lot more time to create your lettering composition. It looks like you are going to spend more time drawing the guides than the actual lettering. Drawing complex shapes accurately isn’t easy, especially if you do not have the right tools. Some of you may already be thinking of learning something else. But what if I told you that there’s actually a tool that will make the whole process much easier? My dear friends, your struggle ends today! A lettering tool designed by a lettering artist for lettering artists. The Composition Ruler is a tool created to assist you in creating beautiful lettering compositions without breaking a sweat. This tool is designed to help you draw easily and accurately and combine shapes for your lettering layout. Currently, it is available in two sizes – 3-inch and 5-inch. The size corresponds to the maximum width of the shapes you can draw. The Composition Rulers are made from clear acrylic sheets, laser-cut for precision, and laser-engraved on the reverse side to prevent shadows from forming. It also comes with an instruction guide on the packaging. I had two choices when I discovered what it takes to create a successful lettering composition. Learn something else or to somehow invent a tool that will solve the problems that I face. The Composition Ruler is not just an ordinary ruler and is unlike any other template ruler for drawing shapes. It is designed with features for measurements, symmetry, and accuracy. The Composition Ruler is engraved with a vertical reference line for center-aligning your shapes. Always align the Center Line Guide to the vertical center line on your lettering to keep your shapes aligned. You don’t have to use a separate ruler to measure half-inch intervals on your paper. With the Measurement Markers on top and at the bottom of the Composition Ruler, you can mark and draw your grid instantly! 1/4″ & 1/8″ Guide Markers. Sometimes a half-inch grid may be too big for your work. Don’t worry about it, you can still easily turn your half-inch grid into a quarter-inch or even an eighth of an inch grid with the Composition Ruler. Simply align these markers to your vertical center line, and use the Measurement Markers to mark the intervals. Design your layout with simple shapes or combine different shapes to create something more complex and interesting. These are quick shapes to draw for your supporting words. This hole points to the center of the circular shapes. What are the benefits of Composition Ruler, and why every lettering artist should use one? Before I show you how to use The Composition Ruler to your advantage, let’s take a step back and go through the steps of planning and designing a lettering composition. There is a previously published article that details this process, you can check it out here. 1. The process of lettering composition starts with picking a quote to work on. 2. Followed by analyzing the quote and dividing it into word groups, which will become the arrangement of how you are going to stack them on top of each other. 3. Next is to assign a hierarchy to your word groups, where you will pick out the important words of the quote to emphasize. 4. After that, you will build your layout by assigning shapes for each word group that will look great when pieced together. 5. Once you have finalized your layout, start to accurately draw your layout shapes where you’ll fill in the words. 6. Now that we have the layout boxes drawn we can start drawing the letters inside of the shapes. Let’s repeat the process with the help of The Composition Ruler! Let me share with you how to use the Composition Ruler by showing you the step-by-step process of drawing the layout for this lettering composition. One key feature of the Composition Ruler is its guide for symmetry and alignment. Move your Composition Ruler to the center of your paper to make sure that your lettering work will be centered. Hold the Composition Ruler in place, making sure it doesn’t move. Use a pencil to mark the Measurement Markers at the top and at the bottom. Connect the dots (using the edge of the Composition Ruler) to draw your vertical center line and your grid lines. If a half-inch grid is too big for you, you can easily turn it into a quarter-inch grid. Align the 1/4-inch Line Guide to your vertical center line, and use a pencil to mark the Measurement Markers at the top and at the bottom. Connect the dots to modify your grid into a quarter-inch grid. You can also use the 1/8-inch Line Guide to turn it into an eighth-of-an-inch grid. Keep the Center Line Guide of the Composition Ruler aligned to your vertical center line when drawing any shape. Build your layout by completing all of the shapes. Basic Shape – if the desired size of the layout shape is similar to the template on the Composition Ruler, trace the whole shape onto your paper. Larger Shapes – If the desired size is bigger than the template, draw the top part of the shape first, then slide your Composition Ruler downward to the desired distance, and draw the bottom part of the shape. Make sure that the Center Line Guide of the Composition Ruler is still aligned with your vertical center line. Combination Shapes – You can combine different shapes to add more complexity and creativity to your work (e.g. you can combine an outward curved top with a rectangular bottom). Feel free to flip or rotate the Composition Ruler 180° to explore the different shape possibilities. Small Shapes – Some of the smaller shapes have their own center guides on the Composition Ruler, make sure to use them for alignment. Use a pencil to do a quick or detailed sketch of your letters before inking, so that you can still make corrections and adjustments to your letter profiles and spacing. Use your pens to ink and finalize the lettering composition! Then clean up your work by erasing all of the guides. 1. Plan your layout before anything else. Start drawing your guides once you have finalized your layout. Trust me, this will save you a lot of time from correcting and adjusting your guides later on. 2. Make sure to give consistent spacing between your word groups to make your whole lettering cohesive. 3. Group the words you want to emphasize individually. The more words you have in a group, the smaller the letters will be. 4. When using complex shapes for your composition, make sure you do not compromise legibility to fit your word into the shape. Where can you get The Composition Ruler? The Composition Rulers are available for order online and at several retail stores. If you have any questions about the Composition Ruler or you want to watch videos of it in action, feel free to drop me a message. I am waiting when it will be more accessible in Europe. I’ve checked in the store (www.RueHigh.com) and with delivery it was 50$, little too much. I added this tool to my Amazon wish list right after reading your article when it was posted. Brilliant & thank you so much for this tool! For USA, I tried to order today & it shows no longer available. I see you are on break until 3/5. Will I still be able to order from Amazon here in the US? Thanks! Hi Jan, unfortunately, it’s currently out of stock on Amazon. Don’t worry, it will be available soon, I already shipped new stocks to their warehouse (for FBA), should be back in stock soon! I JUST got mine through Amazon, can’t wait to use it, thanks so so much! This is so cool! I wonder if there’s one for iPad lettering? This is wow, you ACTUALLY created a TOOL to help out lettering beginners and professionals THANK YOU. This is the one of the most amazing inventions yet I’m sure the world needs this! !